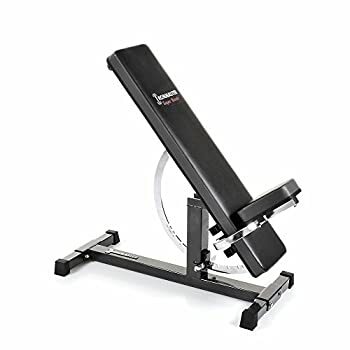 Are you looking for an adjustable bench to complete your home gym or simply replace your current bench with a more solid one? Well, you’ve just come to the right place. In this article, I will show you how to choose the best adjustable weight bench for your workout routine. Besides, at the end of the article, there are the 5 best product reviews so you can choose what is the most suitable for your fitness goals. Generally, an adjustable weight bench is one of the most useful exercise machines you can add to your home gym. Why? Very simple, just imagine how many exercises you can perform with the bench such as barbell bench press, dumbbell bench press or even ab exercises. Therefore, it is very versatile, isn’t it? Now, let’s go into far more detail about the benefits of using an adjustable bench. As mentioned above, adjustable benches are very versatile as compared to flat benches. Specifically, there are different positions so you can adjust the backrest’s angle from vertical to flat to incline to decline (one some models). Therefore, you cannot only do a lot more exercises but also target different angles of the muscles. One thing I prefer an adjustable weight bench to a Olympic weight bench is that it features built-in wheels on the base. That’s why you can lift up a side and roll the bench to your intended place. Actually, this benefit is directly related to mobility. However, this is also a very important factor that makes an adjustable bench different from other benches. As you already know, an adjustable bench is very easy to move, therefore, it’s also very easy to store. This is not only because it has wheels on the base but also because it is significantly smaller and compactable to some extent. Whether you are a pro bodybuilder or a beginner or a person who just wants to get fit, an adjustable is a good choice. The benches are very easy to use and they can help you retain correct form and posture during the exercise. Besides, there are different seating positions so that an experienced bodybuilder can target hard-to-reach muscles at different angles. 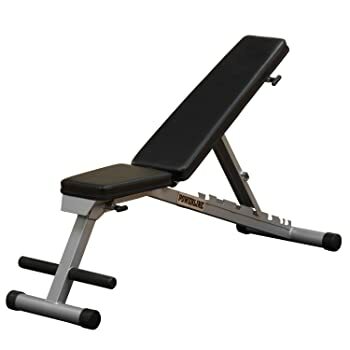 It’s not hard to see that a good-quality adjustable weight bench is much cheaper than a good-quality traditional one. Actually, this is not because the traditional one is better, but it’s much bulkier and heavier on account of the extra steel. This extra steel is what makes the bench more expensive and therefore, if affordability is one of your priorities, an adjustable bench is your best bet. 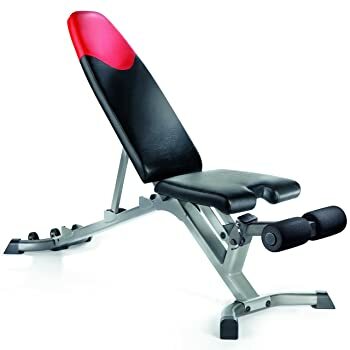 Now, your question is: “How can I find the best adjustable weight bench that fits my needs?” Honestly, choosing a suitable bench is not very easy, especially if you are a beginner in this fitness world. The reason is that there are many things to consider. However, I’ve managed to narrow the list to a few essential things as follows. One of the first things to consider when choosing an adjustable bench is stability. A weight bench should be a stable support system when you’re lifting weights, especially during compound movements with good balance required. Hence, make sure you feel comfortable and stable on the bench you are going to choose. If you lift heavy weights, then do not go for any bench with low weight capacity, 300lb, for example. Or else, you may end up hurting yourself when the bench isn’t able to hold your body and the weights you’re lifting. However, if you are a beginner or you’re doing basic weight training, a bench with low weight capacity is not a bad choice. It is obvious that adjustable weight benches are versatile but there is still a huge difference between them. In fact, the number of positions ranges from 3 to even 11. Therefore, it’s very important for you to make sure your bench has all of the different positions you need for your workout routine. Put it simply, just think about every exercise you usually do on a weight bench. For instance, if you often work out with incline and flat positions, then a bench with decline positions is not necessary. Have you ever felt annoyed when the bench is long enough to cover your head? If you are over 6 foot tall, you’ll definitely have trouble if your bench is too short. Just take a look at the dimensions of the bench you want to buy compare them with the dimensions of your current bench (if any). However, you can simply choose a bench with height adjustments. Another thing to consider when it comes to comfort is the upholstery. In fact, thin back pads and padding on the seat are usually what make you less comfortable during the exercise. Hence, make sure the upholstery of your weight bench is 6 inches thick at least for your best performance. Adjustable weight benches themselves do not take up much space in your gym and you can easily store them out of sight. However, you still need to consider how much space your home has or whether you need to move it around often? In fact, there are some heavy-duty units which are pre-assembled. Honestly, having a clunky bench like that in a small home gym is a problem. If space is your problem, it’s nice to buy equipment which can be stored away when not in use. In this case, a foldable weight bench is a perfect choice for you. You can easily fold it down to a smaller size and store it anywhere you want. Last but not least, you need to consider the price. Remember that no matter what kind of trainer you are, looking at a product which you can’t buy just a waste of time. Just define your price range and you can cut out a majority of them to find the best adjustable weight bench. This way, you will know what you’re looking for: a commercial bench for elite level, a mid-range or beginner-level one. Bowflex is a very popular brand when it comes to weight benches. 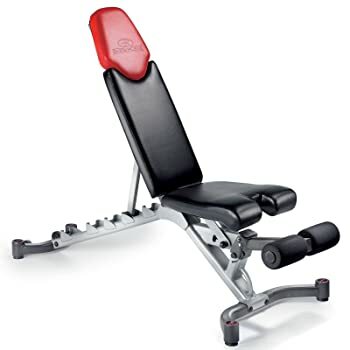 This Bowflex 3.1 adjustable weight bench is versatile gym equipment. It is made out of commercial high-quality steel, therefore, providing great support and comfort. It has only 4 different positions, a bit less than other adjustable benches. Actually, it is quite enough for anyone who has general fitness purposes or beginning lifter. Besides, changing angles is very smooth and straight forward, hence, it’s easy for you to target different parts of your muscles. There is a removable leg brace so you can work out easily in the decline position. The bench also features wheels at the back for ease of movement and quick storage. A downside of this product is that it has the maximum weight capacity of only 300 lbs. This is why it is highly recommended for beginners and women, not for serious lifters and bodybuilders. This bench is a good choice if you are looking for a reliable, sturdy adjustable bench. It’s quite similar to the previous one but it has more positions and angles. In addition, the seat can adjust to 2 different positions for working the incline, ensuring extra support and comfort. Therefore, you won’t end up slipping down when doing incline bench press with heavy weights. With this bench, you will have a stable base and you won’t lose your grip on the seat. It also features a weight capacity of 400 lbs and that is enough for most lifters. Besides, there is a removable leg attachment so it’s comfortable for you to work the decline position. Just like the Bowflex SelectTech 3.1, this one features wheels which make it easy for you to move in and out of place or store. A downside is that although the upholstery is durable and easy to clean, the padding can wrinkle after uses. That’s why the bench may look older than it actually is. This weight bench can perform as well as other expensive counterparts, but at a lower price. With 7 different adjustment positions including decline, you can do a lot of exercises with it. It features bottom transport wheels for easy storage and mobility. What I love about most this bench is that it is foldable. In fact, it can pack down flat so you can even store it under your bed. The max weight capacity is 500 lbs, which is more than enough for people with general fitness purposes and beginners. Actually, it also works for serious lifters but this is not highly recommended.However, this one has slightly bigger footprint than others. Furthermore, the seat is not adjustable, thus, you may end up slipping down when working the incline position with heavy weights. The first thing you have to know about this bench is that it is a heavy-duty adjustable bench. With the max weight capacity of 1000 lbs, it may be the best adjustable weight bench if you’re a serious lifter or elite bodybuilder. Furthermore, it has 11 different adjustable positions so you can target even hard-to-reach muscles. Although the bench is super durable and can hold up to 1000 lbs, its total weight is only 60 lbs, not too heavy. Besides, the footprint is quite smaller than most other benches. It also features super heavy frame and padding for max comfort and safety, especially beneficial for lifting heavy weights. The cover is made out of Vinyl, therefore, it is very easy to clean the bench. A downside is that this bench has no wheels which make it difficult for you to move in and out of place. Also, there is no decline position so you can’t target muscles like lower chest well. The Rep adjustable bench can also hold up to 1000 lbs so it’s a good choice for everyone. With the solid steel frame, it is great for use not only with dumbbells but also smith machine and power rack. It has 7 different ladder positions and 4 seat position adjustments for more comfort. The adjustable bar has no flex, providing extra support and stability for anyone who works the incline position a lot. In addition, the product features Vinyl covered rollers which keep your legs still while you’re working the decline position. Also, the Vinyl material makes it easy for you to clean the rollers. A downside of the bench is that it’s quite heavy, at 85 lbs. Furthermore, the wheels are not large enough to have the bearings. The rubber grips on the end of the legs may fall off over time. Moreover, the seat is quite slow and difficult to change although it’s very stable. 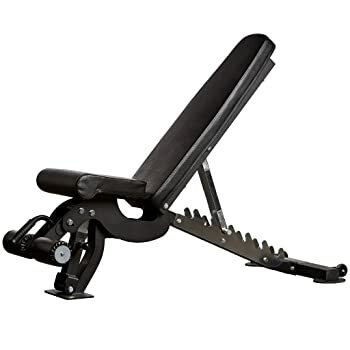 Those 5 adjustable weight benches are all good products on Amazon which are awarded ratings from 4.5/5 to 5/5 stars. They all have their own pros and cons and they serve different training purposes. Therefore, you just need to follow my guides above to figure out which is the best for you. Hopefully, you guys enjoyed my article and found it helpful for your fitness goal.